Alaska’s senior U.S. Senator – who had never formally endorsed Trump – is up for reelection this cycle and made her decision to call for Trump to be replaced at the top of the ticket with a very large lead in her race. Polling in the Last Frontier State has been scant but surveys from Moore Information found Murkowski with less than 50 percent of the vote in their mid-September (48 percent) and early October (49 percent) polls since Joe Miller became the Libertarian nominee, although still holding a 30+-point advantage. Murkowski was polling at 56 percent in mid-August prior to the launch of Miller’s campaign. The October survey found Miller polling in a distant second with 16 percent followed by Democratic nominee Ray Metcalfe at nine percent, independent Margaret Stock at eight percent, independent Breck Craig at one percent, and Ted Gianoutsos at zero. Miller, Metcalfe, and Gianoutsos have run for the U.S. Senate 10 times collectively. While Senator Murkowski enters the last month of her campaign as a fairly popular figure in the state, it remains to be seen whether her explicit disavowal of Trump gives Miller – running to Murkowski’s right on many issues – a bump from Trump’s base. While a mere bump would not threaten Murkowski’s reelection chances, it could ensure she gets her name in the record books. Smart Politics reviewed every U.S. Senate contest in the direct election era and found that if Lisa Murkowski wins less than 50 percent of the vote in 2016 she will become the first senator to win a seat with a plurality of the vote three times. To date, there have been over 165 plurality winners since direct elections began more than a century ago (including U.S. Senate preference votes in those states that held such contests before the passage of the 17th Amendment in 1913). Murkowski defeated former Governor Tony Knowles by 3.0 points in 2004 with 48.6 percent of the vote less than two years after she was appointed to the seat amidst controversy by her predecessor and father, Governor Frank Murkowski. In 2010, Senator Murkowski lost the Republican nomination to Joe Miller by 2,020 votes but defeated the Tea Party upstart by 4.0 points as a write-in candidate in the general election with 39.5 percent. Overall, 18 winners of U.S. Senate elections have fallen short of the 40 percent mark. Overall, each of the last four Alaska U.S. Senate elections since 2004 have not produced a winner who earned the support of a majority of voters. Democrat Mark Begich won with 47.8 percent in 2008 with Republican Dan Sullivan unseating him in 2014 with 48.0 percent. Another plurality victor in Alaska next month would tie the all-time mark of five in a row set by Nevada: Republican George Nixon in 1910 (48.0 percent), Democrat Key Pittman in 1912 special (39.8 percent), Democrat Francis Newlands in 1914 (37.5 percent), Pittman in 1916 (38.8 percent), and Democrat Charles Henderson in 1918 special (47.7 percent). Third party, independent, and write-in candidacies have had strong showings in Alaska over the decades with independent Bill Walker winning the governorship on a ‘unity’ ticket with Democratic Lieutenant Governor Byron Mallott in 2014. In addition to Murkowski’s eyebrow-raising write-in candidacy to save her seat in 2010, plurality U.S. Senate victories were enabled in part by incumbent Ernest Gruening’s write-in campaign in 1968 (17.4 percent), Alaska Independent nominee Robert Bird in 2008 (4.2 percent), and Libertarian Mark Fish in 2014 (3.7 percent). Since 2000, there have been 27 U.S. Senate elections with plurality-winning candidates. Previous: Is Rob Portman Still Underperforming vis-à-vis Trump in Ohio? 3 Comments on "Murkowski Could Become 1st US Senator with Three Plurality Victories"
2. 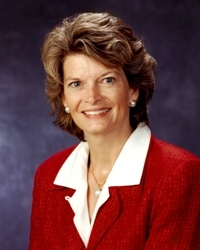 She already is the first US senator from AK to have been born within the state. She is also the first person to have won a Senate election as a write-in candidate after having lost a primary election (Thurmond of SC launched one without a prior primary loss). So, what is yet another personal milestone? 1980 and 1992 are not “back to back cycles.” The 1986 election intervened. D’Amato won 58% that year.